Parents: sip your wine or tea and let the children decide. 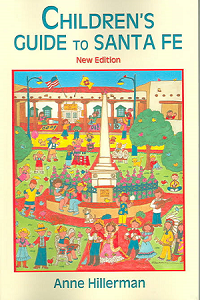 Anne Hillerman's guide allows for plenty of child-directed choice and activity with its enticing photos of the Santa Fe Ballet, the Museum of International Folk Art, the dinosaur skeleton at the New Mexico Museum of Natural History and Science, the ladders and kivas of Bandelier, and the Sandia Peak Tramway. Ideas abound for winter and summer excursions, from theater and symphonies to skiing and river-rafting. Seasonal events like Zozobra are highlighted in addition to activities that nourish the children's talent and growth through extended participation. Santa Fe hosts an ongoing children's opera, symphony, and performing arts school, and the girls' film school runs for two weeks each summer. Geared to adolescent readers, Hillerman includes a brief sketch and timeline of Santa Fe's cultural, economic, and political history that delineates the Pueblo Revolt of 1680, the Spanish reconquest of 1692, the Mexican and American territorial governments, trade and trail routes, disputes regarding authentic architecture, Catholicism, 1912 statehood, and the region's growing influence as a center of art and culture.